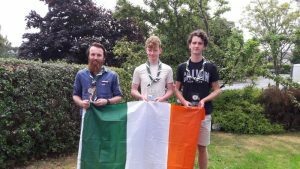 Two Galway ex 420 sailors recently represented Ireland at a major international Sea Scout event , the William I. Koch Cup, held in Galveston, Texas. The William I. Koch International Sea Scout Cup is a biannual Sailing Regatta put on by Sea Scouting (Boy Scouts of America). The event was founded by Bill Koch in 2002 in order to allow Sea Scouts from around the world to compete. Skipper Rob Talbot and crew Cathal Mahon are members of the Port of Galway Sea Scouts (24) of Galway and they were accompanied by CIaran Jordan ( also ex 420 sailor) to compete in the 4 day event sailed in light and shifty conditions. The boys qualified for the Koch Cup fleet (Gold fleet) by finishing second in their qualifying group behind an Australian boat and headed in the final day of racing with only a few points separating the top 10 teams , making for a thrilling finale. Out of a fleet of 32 teams the silors acquitted themselves well and finished in 6th place overall. 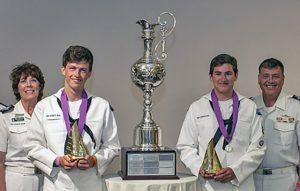 The event was won by an American crew who won the solid silver trophy which gives the Americas Cup Trophy a run for its money in terms of size and value.